Unlike the original blog, I have delayed putting this page up until all material is posted. This permits reading the articles in first to last sequence, unlike the usual blog format which goes from the most recent backwards. Because there is so much material, I am going to break it down by year. This page is when the war is in the heart of it all, 1863. Strictly speaking this is not about the Fighting Fifth, it's more about the fighting for coverage by the Detroit Free Press and the Detroit Advertiser and Tribune. Correspondent G.W.W. is published ten days after his delayed Christmas eve letter. 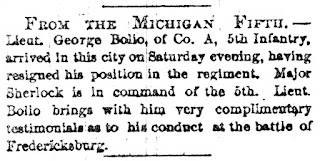 The same issue also gives brief notice of Lieutenant George Bolio's resignation of his commission and return home. 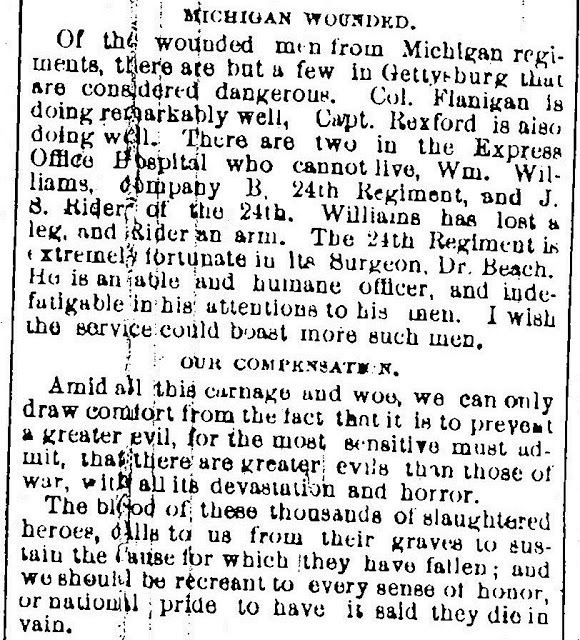 No mention is made of the lieutenant's condition, only that he had "very complimentary testimonials as to his conduct at the battle of Fredericksburg." This letter from G.W.W. may have its difficulties in clarity, but the Library of Michigan microfilm had the opposite side bleeding through on my own version, so I'm delighted that John had a copy as good as this. Detroit Advertiser and Tribune correspondent, G.W.W. comments on morale. The next newspaper posting won't be until mid-February. Families and others concerned with the Fifth didn't know when to expect an article, so maybe uncertainty here is appropriate. That bit of rapid news will be the last seen about the Fifth Infantry until April. Picture yourself waiting for over a month for information about how they are doing! The past month and a half reflects the delay in publishing news about the Fighting Fifth. Imagine the dismay of people back in Michigan if they received no letters and saw no newspaper articles during that time. The next article will again have a delay, but not as great as the past month and a half. April only had three articles, but there will be many in May. When I started this project I didn't expect to practice computerized calligraphy. There was a part of this article which was so illegible I considered re-typing it because I could just make out what was said if I enlarged it considerably. Instead it seemed better to take the shadows of letters and re-draw them to make the message clarified. Thanks heavens for the ability to correct faded and scratched microfilm. 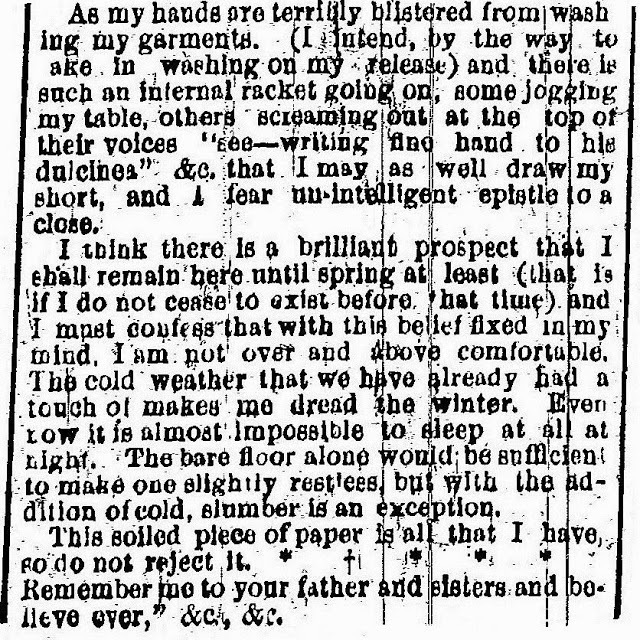 By enlarging the first column and tracing over the "ghosts" of letters, this article is understandable even with a large scratch. I make no claims that the "calligraphy" looks as good as the original, but it does let you read the text. The first column is in two parts. The 5th should enjoy their leisure. It won't last. May was the start of a lot of activity that saw important battles in 1863. 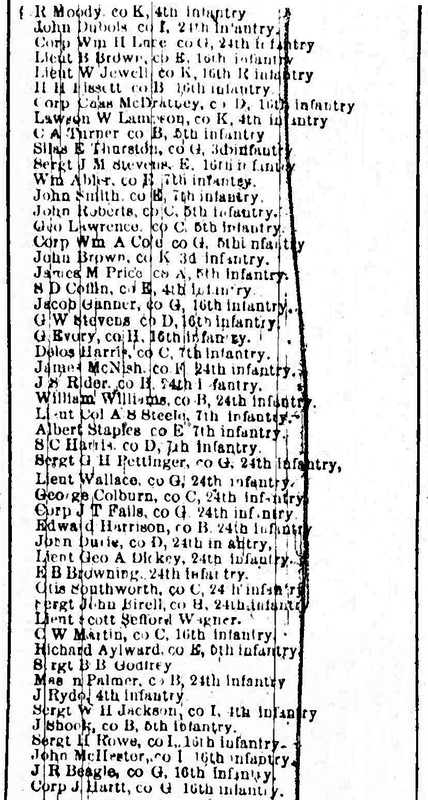 Today's post was the one hundredth for Michigan's "Fighting Fifth" Civil War Infantry, but it technically isn't about the 5th. Instead it gives a view of the "war" between the Detroit newspapers covering them. 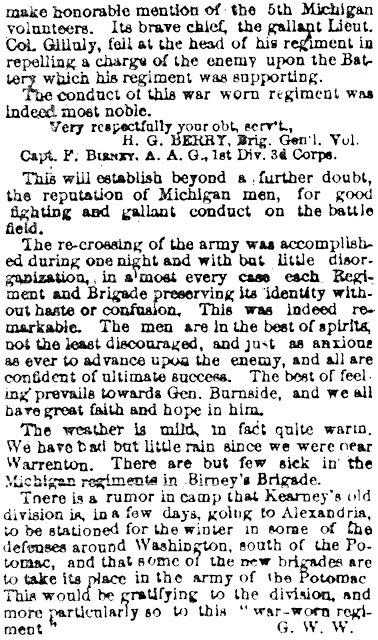 Both Detroit area newspapers published about the Fighting 5th Infantry on May 14. 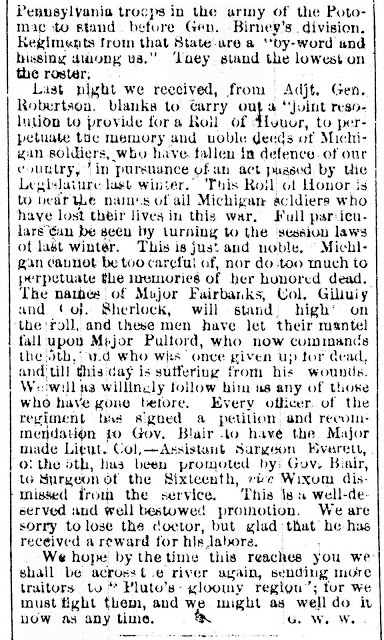 The brief article in the Detroit Advertiser and Tribune looks back at the battle where Lt. Col. Sherlock was killed. 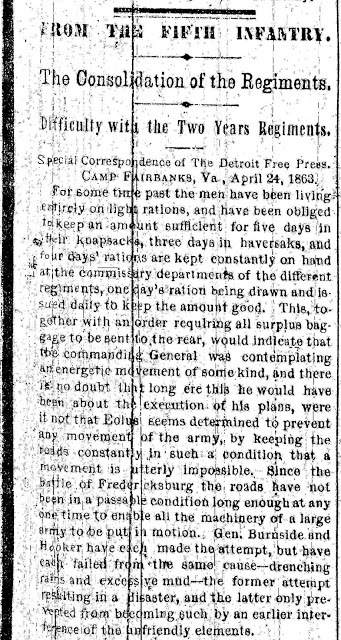 The Detroit Free Press is a full-length article looking back in more inside detail at that and other battles in the area of the Rappahannock, Fredericksburg, and Chancellorsville. Somehow that is where my copying ends. My apologies if there is more, as I believe, that should have been saved. Bulk copying at a distant library made double-checking impossible. The next two days will have more articles. 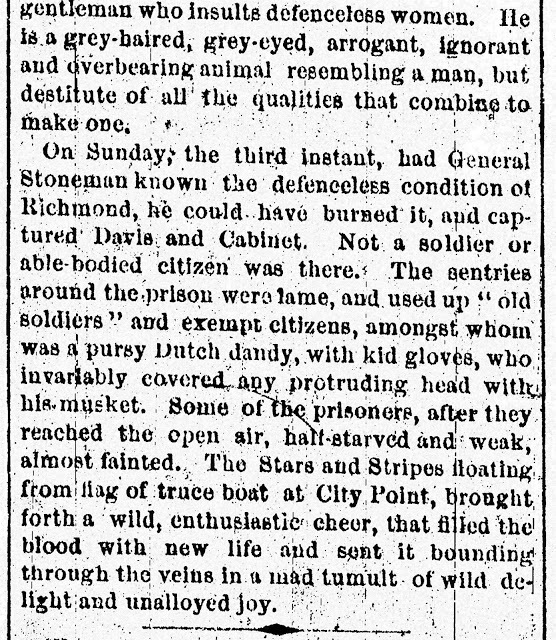 This is an unusual look at life in the Confederate Prison, where prisoners from the 5th also went. Blobs erupt throughout the article unfortunately and the best you can do is guess what they conceal. Presumably they were on the original newspapers. Size variance occurs during saving on a flash drive. The largest possible size is always used here because it helps with legibility. This next section has even more blobs. The Detroit Advertiser and Tribune does its own wrap up of the recent battles. It also looks at the problem of "expiring regiments." 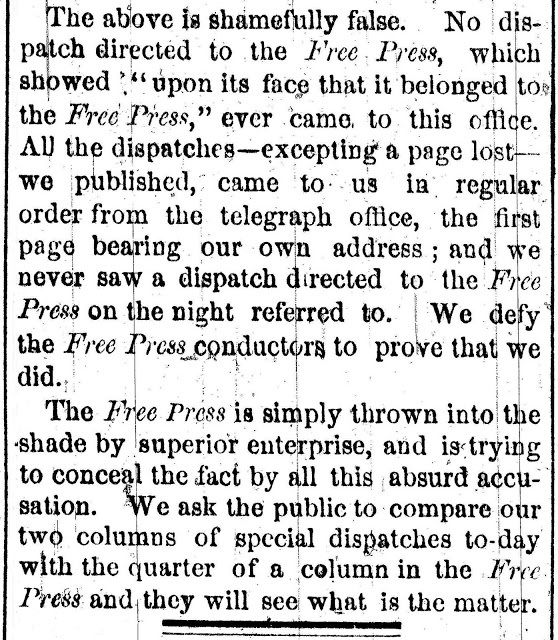 This is the Free Press view of the earlier dispute of May 11 with the Detroit Advertiser and Tribune about possible stealing of telegram coverage. The weather is warming up and the soldiers of the Fighting Fifth are dealing with Confederate deserters and rumors of future action are beginning. Of course the men want to return to action, but there will be no further word from the Fifth until the end of the month. Action finally is starting up. Both the 3d and 5th Mich. Infantry hope they are heading into decisive battles. These two regiments worked closely together. 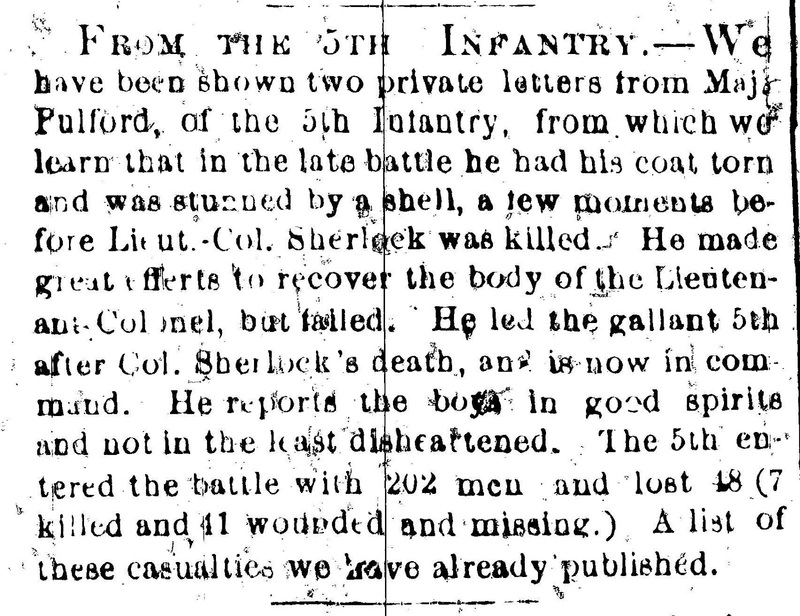 When the 3d eventually was too decimated to continue, Isaac Lerich, was one of those from the 5th who were mustered back in, after recuperating, to keep the "Iron Brigade" operating. The reproduction at times is a bit faint. My one effort at "drawing" a "5" was sufficient to make it understood and also that I shouldn't attempt any more. By reading, even those letters too faint to read, the context clarifies what is missing. Wikipedia does an excellent job of telling us more about General De Trobriand, a Frenchman who came to the U.S. on a dare when he was 25. He became a naturalized citizen and general when the war broke out. He doesn't receive nearly the attention he deserves. Read the article and I think you'll agree. This is NOT from 150 years ago in the Detroit newspapers, but I think it needs featuring. The Battle of Gettysburg has been considered by most looking at the war to be one of the most crucial battles and the Fighting Fifth was in the thick of it. At the recent Civil War days at Greenfield Village I met Chaplain Alan Farley who has been ministering to reenactors since 1984. The 20th century's World War II created the quotation "There are no atheists in foxholes", but it surely was true for the War Between the States as witnessed in letters sent by the soldiers. Chaplain Farley has an email list which you can receive by using his site's contact form (use the hotlink for his name to reach it). 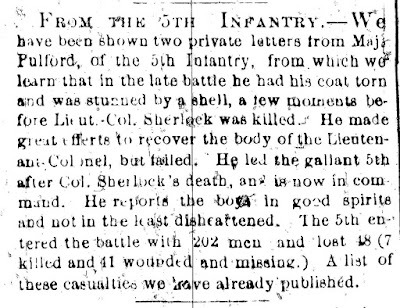 The following letter about Gettysburg is from a Confederate soldier, but surely the Fifth would similarly agree this battle was well-described for them, too, even if they didn't see the dying soldier specifically mentioned in it. One of the saddest sights I ever witnessed was on the field of Gettysburg. We had captured some fifteen hundred prisoners and I was one of the guards marching them to the rear. Passing along where there were hundreds dead, wounded and mutilated, I saw a soldier with a North Carolina regiment mark in his cap leaning against a fly tent. A fragment of a shell had struck him above the breast bone and tore the whole stomach lining away leaving exposed his heart and other organs which were in motion and he seemed alive and conscious. I lingered a moment for I had never seen anything so shocking before nor have I seen the countenance of a dying man so peculiar and unearthly. The artillery fire at the battle of Gettysburg was something terrific. The battle field abounded in mounds and hills which were advantageous for planting and operating the cannon and the batteries on both sides were the pride of either army. I do not know the number operated at the same time but it was said to be five hundred; but I do know the roar was awful and the heavens surcharged with hissing, roaring balls screeching, screaming, bursting shells enveloped in sulphurous smoke that clouded the July sun. When the heavens are rolled together as a scroll in the Last days I doubt whether it will present a more awe-inspiring spectacle than that historic field presented on that fatal day. The prophet Joel preached that in the future God will judge the earth. No other day in history (including Gettysburg) will compare to the awfulness of that great day. That comes from Chaplain Farley's weekly devotions. I've deleted his contact information that appears on the email, but you can reach him through the previously listed hotlink. There also is a National Civil War Chaplains Research Center and Museum. This isn't specifically about the Fighting Fifth, but rather about making war claims of injury and loss. 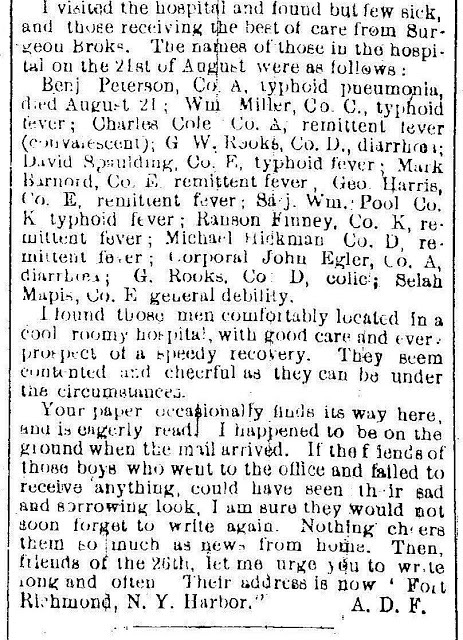 It is interesting that later when Will and Isaac Lerich were seeing their early demise from their war injuries they had to fight in an attempt to get pensions for their soon-to-be widows. Compensating our military families seems to be a continuing battle off the field. 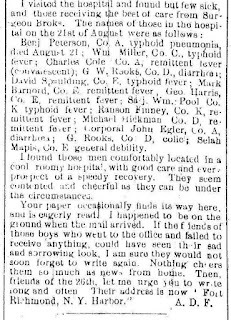 During the war, after injuries and time at Libby Prison, the Lerich brothers served a time in the Invalid Corps. Will later returned to the Fifth. Ike's injuries, after laying on the battlefield for ten days, took longer to recover. 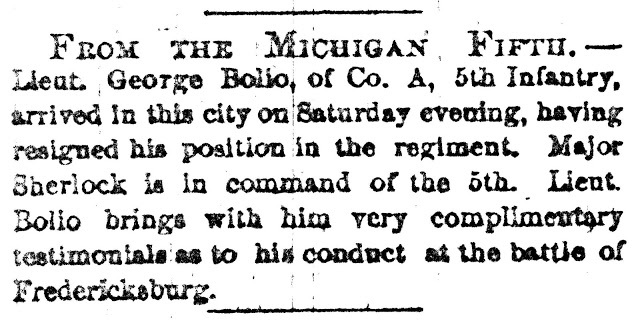 When he did, he became an officer in the reorganized Michigan Third Volunteer Infantry. (Not bad for somebody who started out as a Bugle Boy! He finally mustered out in San Antonio as a Major, marrying one of those girls he said was "just a little bit secesh.") The Invalid Corps was eventually renamed the Veteran Reserve Corps and permitted disabled or infirm soldiers and former soldiers to assist the war effort in lighter duty away from the battlefields. My reproduction from the microfilm starts out clearly. Unfortunately the mid-section is quite faint and the end is better, but still doesn't begin as well as at the beginning. There is even a small wrinkle that was part of the original microfilming. For what you can read, I still find it of interest and hope you do, too. The first two parts are faint, but mainly legible. It was difficult even to decide where it ended and continue it in the final section. The two paragraphs completely hopeless have these titles, "(LSK:?) Still in Service" and what seems to be " How to Make Claims." DRAT! My apologies that it's so poor. Word in the newspapers of the Fifth doesn't appear again until later in the month. This was originally posted on the eve of the 4th of July, I believe it's worth a look back at how our "wounded warriors" and their families are treated. They fought to keep our country whole and safe, celebrating the 4th. Perhaps you wonder why on July 4 there was no posting about this battle often considered a turning point in the war. 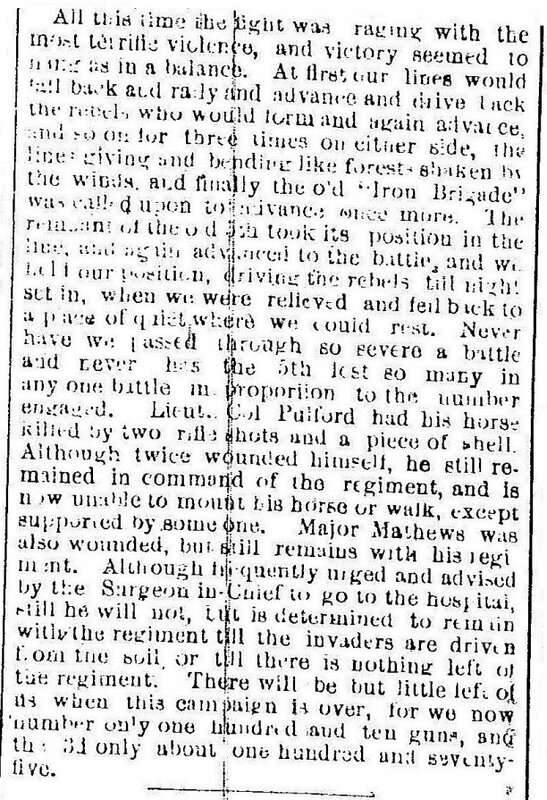 The Regiment was commanded at Gettysburg by Lieutenant Colonel John Pulford, who was wounded on July 2nd - the third of five times during the war. From the Gettysburg monument: "Effective strength July 2nd 1863; present and detached service 21 officers and 262 men, total 283. Casualties: Killed 2 officers, 17 men; Wounded 8 officers 78 men; Missing 4 men; Total 109." "The regiment fought here about 4:30 o'clock p.m., July 2, 1863, after it had been assembled from the skirmish line far in advance of this position. It moved to the support of the 2nd Corps in resisting Pickett's Charge, July 3." On the actual 4th of July I didn't post for the very reason families and others concerned about the "Fighting Fifth" saw nothing specifically about them. My listing of posts here primarily found articles through the indexing of Helen H. Ellis, of Detroit Public Library's Burton Historical Collection. Her book, Michigan in the Civil War: A Guide to Material in Detroit Newspapers 1861-1866, was published by the Michigan Civil War Centennial Observance Commission in 1965. Occasionally other articles caught my eye while scanning the Detroit newspaper microfilm. (I would have added the Oakland Press, but the Pontiac microfilm rolls are missing.) Additionally I gladly accepted articles from others sending me material on the Fifth and inserted them into the proper dates if received in time. Ms. Ellis's efforts certainly covered beyond Detroit because companies were gathered from many Michigan communities beyond the reach of the Detroit newspapers. Because those communities' newspapers didn't have an index like Ms. Ellis's book, however, I went only that far. So I repeat what you may be wondering: Why has there been no posting about this battle often considered a turning point in the war? If you are wondering that, imagine, as word filters back home of the enormity of this battle, what is going through the minds of all concerned with soldiers in the Fifth. Articles were written by correspondents in the very thick of the action. Word came, but only as fighting and other duties eased and communications could be sent. In the meantime here on the homefront the silence continued. 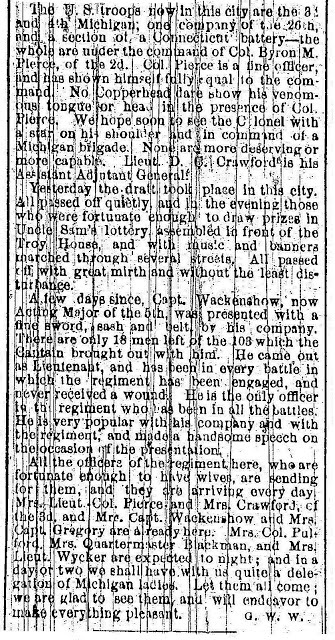 Detroit Advertiser and Tribune, July 23, 1863 GETTYSBURG! 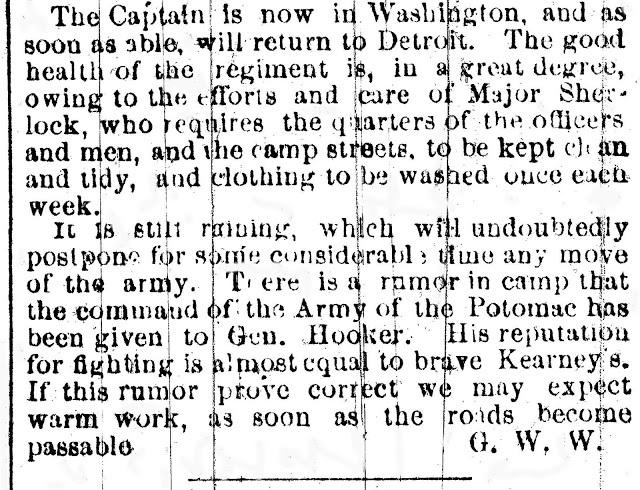 Finally the news of Gettysburg arrives in Detroit! The editors of the Advertiser and Tribune say it has been held up in lost mailbags. Surely news that a terrible battle has been waged has been told, but until now the newspaper has given no information. The usual correspondent, however, is supplemented by a second article on the same front page covering the news from the hospital there. 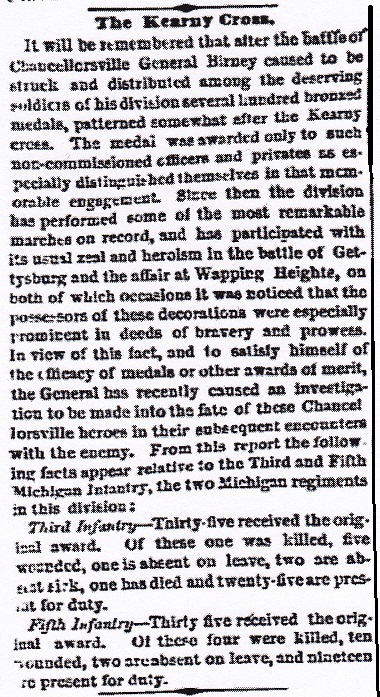 The Third Michigan Infantry has worked closely so the first article covers both the Third (or Iron Brigade) and the Fighting Fifth. It's hard to believe the second article came from the same microfilmed front page, but it did. Where the first article has gaps in letters and words, this is clear or even has blobs. Still the sense of both articles is usually figured out by the context. The lost mailbag's information on Gettysburg continues. Sometimes I beat myself about the quality of reprints from the microfilms. Other times I realize the microfilm dealt with flawed originals. I tried to enhance the images I've saved. Doing this, I hoped to remove as many flaws as possible and improve what remained. One benefit I have is the ability to take my images and enlarge them beyond the space my site's template permits. Here I'm going to "translate" what I see, and also give the largest version of the flawed originals that fit my space. You may decide for yourself if you agree. Parenthetic and underlined comments are all mine. It starts out reasonably legible, becomes awful, then the good news is that, even with a page that was apparently folded, the end of the article is much easier to read. Special Corr. of the Advertiser and Tribune. 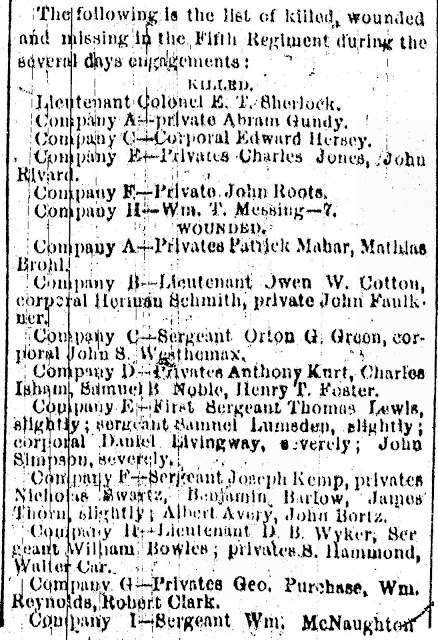 Headquarters 5th Michigan Infantry near Warrenton, Virginia (uses the state abbreviation), July 29, 1863. I'm glad I don't have to pay for each question mark as there were plenty. 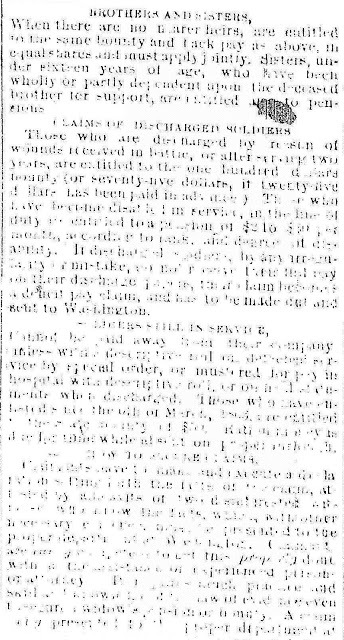 If you have a better copy or can clarify the text by using either the original or if the Advertiser and Tribune had the same article at a different time of day from the microfilm at the Library of Michigan, please contact me. 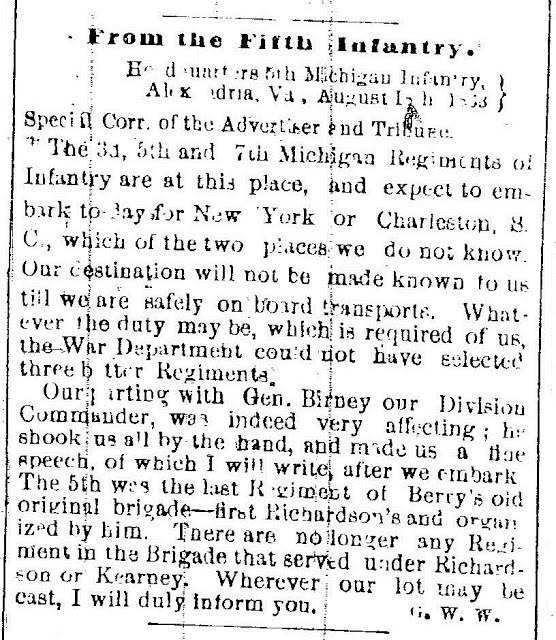 Mid-August in the wake of Gettysburg is a time of consolidation for the Union, including the Fifth Infantry. The 5th stays in the ruins of longtime southern resort, Sulphur Springs, with just enough reminders of the war. 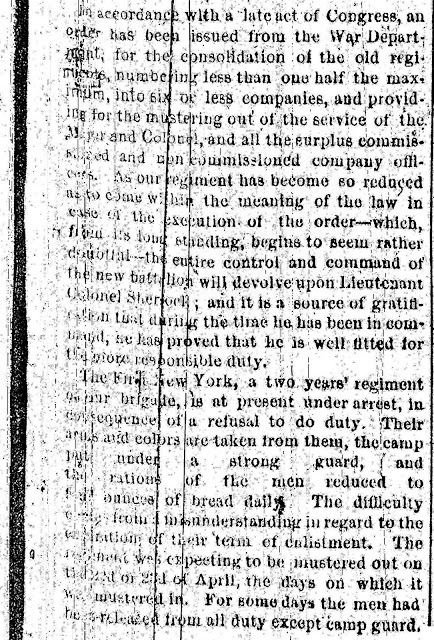 On July 13 - 16 the Invalid Corps joined with 5 regiments pulled away right after Gettysburg to quell the New York City Draft Riots. Today we have a rare wealth of newspaper articles in both the Detroit Advertiser and Tribune and in the Detroit Free Press. 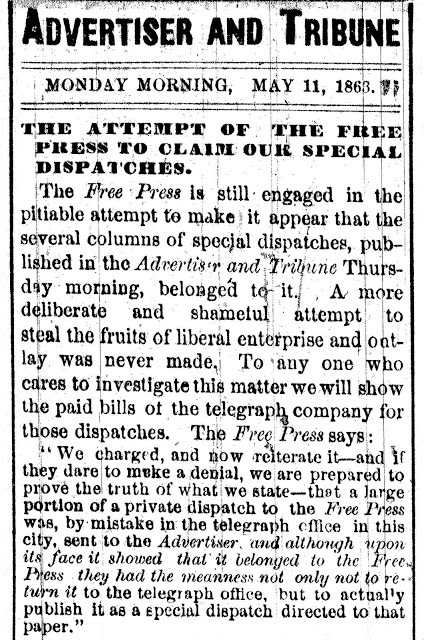 The Free Press sentiments were clearly those of the Copperheads. I've given the link to the Wikipedia article calling them the Northern Democrats wanting immediate peace with the Confederates. Of course there's far more to the story than that, which is why I gave the Wikipedia link. It's also why, with both newspapers having an article on the same day, I posted the Free Press later. Anyone concerned about the Fifth would have chosen the Advertiser and Tribune first. A major topic here is the health of the regiment. Of course all at home caring about a soldier worry about his health, but this goes beyond that. Not only was August a prime time for sickness, but it was also prime time for battle. A healthy regiment in the wake of Gettysburg is a sign of good morale. Also more soldiers died of sickness than bullets in the war. As for supplies, any soldier can sympathize with the Union carrying more than the Confederate soldiers. The Spencer rifle also was a "game changer" that the soldiers enthusiastically received. William Lerich wrote a letter home about his excitement and conviction that it would end the war. Above the Detroit Advertiser and Tribune article was posted here. 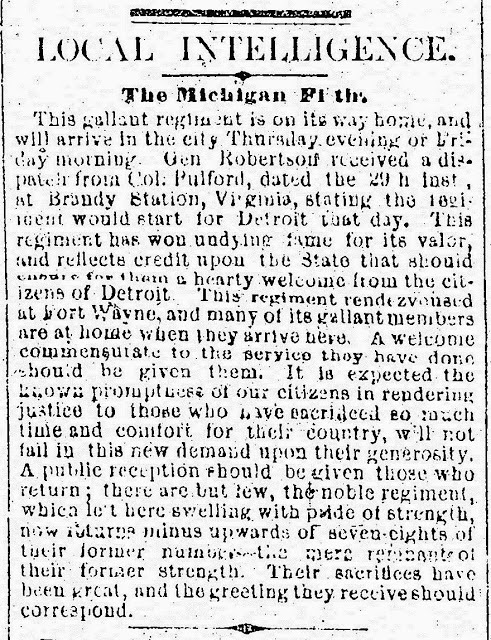 The Detroit Free Press sympathies for ending the war probably are the reason accounts of the Fighting Fifth are so rarely published. The following is an exception from their correspondent, C.B. 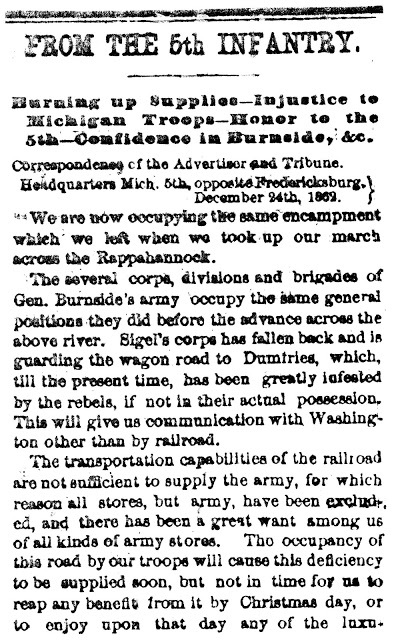 with the Fifth noting the changes since Gettysburg and the accolades from both General Birney and the French Colonel Detrabian, who lovingly calls them his "leetle Fifth", saying he would rather command their regiment than "von whole division." 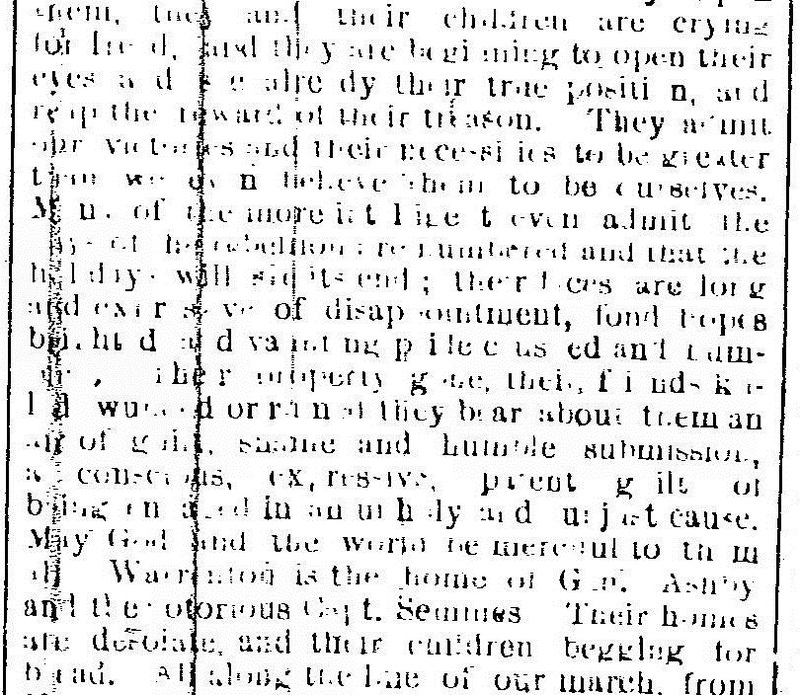 I repeated the French officers comments as the microfilm is badly scratched. The scratches could be removed by software, but leaving the scratches in lets the text appear better than taking them out. The joys of microfilm! That speculation will be answered in a very brief posting on the 29th. The Advertiser and Tribune now gives its brief view of the transition noted in the Free Press article. 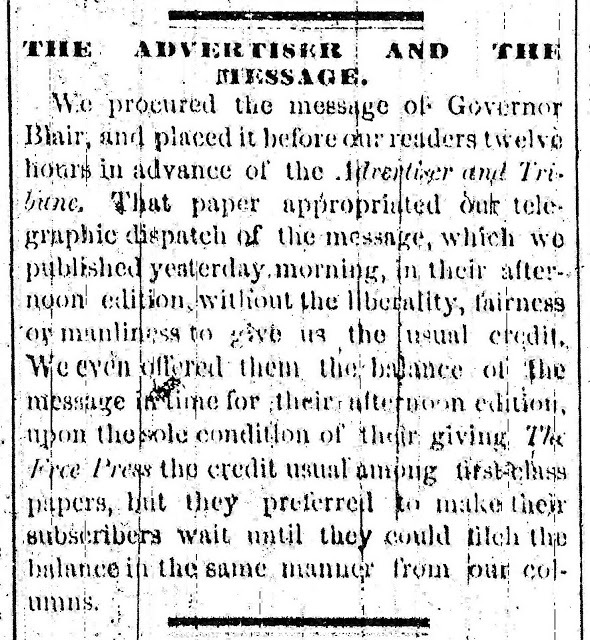 The Free Press continued their efforts to get the news out more rapidly and very briefly has its say on the 29th. Check then to see if the Fifth was sent to New York or Charleston. Today's article is so brief I copied it by hand and re-typed it here rather than make a copy. Why? An unnamed database reference publisher claims copyright on the "historical Detroit Free Press." 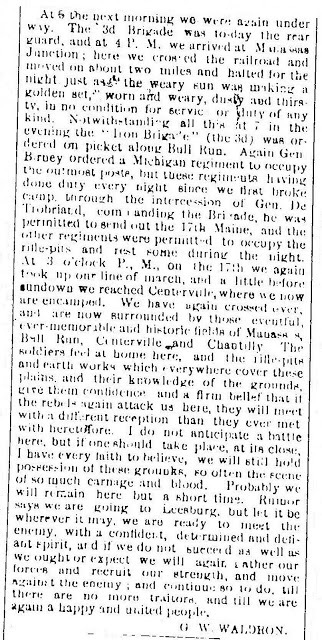 I use the microfilm at the Library of Michigan, but find material on the "Fighting Fifth" using the Civil War Centennial indexing of the Detroit newspapers done by Detroit Public Library's Burton Historical Library's Helen H. Ellis. 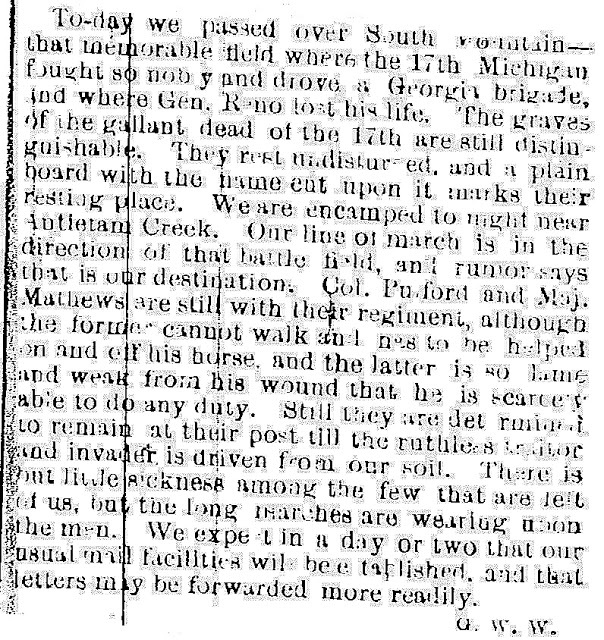 Her Michigan in the Civil War: a guide to material in Detroit Newspapers 1861-1866 has helped me find these articles efficiently so a few trips each year captured articles to be cleaned up and republished here. The intent behind the copyright Public Domain law is to keep alive written works after those who created or published them have been compensated. Written works published in the U.S. after 1923 are intended to be in the Public Domain and so these articles should be safely available to all. So what's the problem? The Detroit Free Press microfilms I use at the Library of Michigan are not always the same edition Ms. Ellis used at the Burton. The same editions she used have been captured by this unnamed database reference publisher. If I want to use their database, I'm told I would have to pay them a royalty. Hmmm. I can understand their charging libraries to buy and offer their database, but researchers should be allowed to have free access to the articles and including them in their research. Thank heavens they don't have the only copies of those editions, but it's not always easy to go to multiple locations to obtain them. So here is the brief public domain article without benefit of the unnamed database reference publisher. 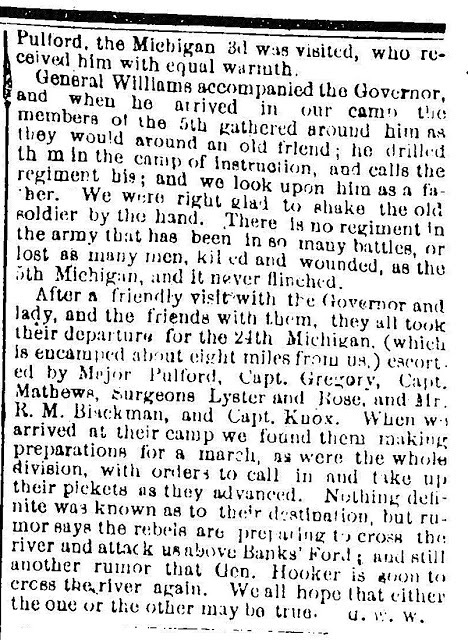 IN NEW YORK - The Third, Fifth and Seventh regiments of Michigan infantry have recently been sent to New York. Their ranks have been very much reduced by battle and disease, and they are sent there for the purpose of guarding rebel prisoners. This was listed as Field Notes for the 3d, 5th, 7th, and 26th MI Infantry. Actually the correspondent, A.D.F. from the 26th, misses the 5th and 7th, but what he says still is true for them. Regular 5th correspondent, G.W.W. will have more to say about the 5th in New York soon. 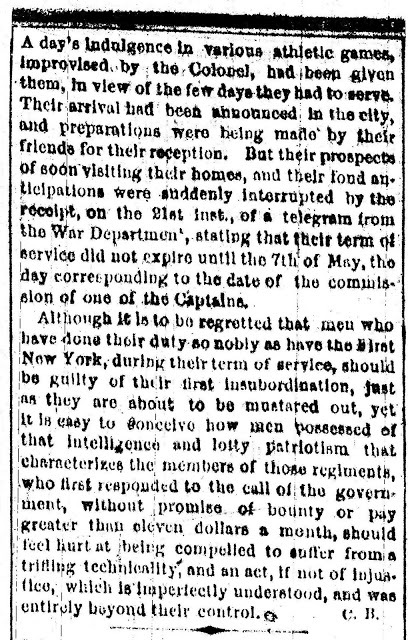 The Draft Riots of New York City are infamous, but the Special Correspondent of the Advertiser and Tribune sounds as if the Fifth had little difficulty in Troy, New York, which is very close to the state capitol. 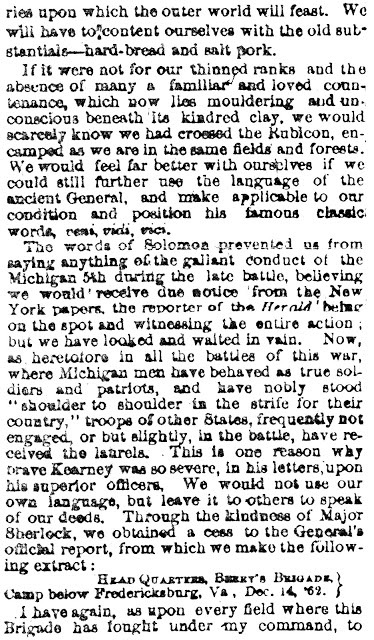 Understandably his job may have been to reassure readers back in Michigan that their soldiers were doing well, but he certainly gives a different view from anything verging on a riot. By this time it's also presumed that you know Copperheads were the opponents of the war, as opposed to the reptiles often displayed at nature centers. Surely the officers' wives would not be expected if serious trouble was anticipated. 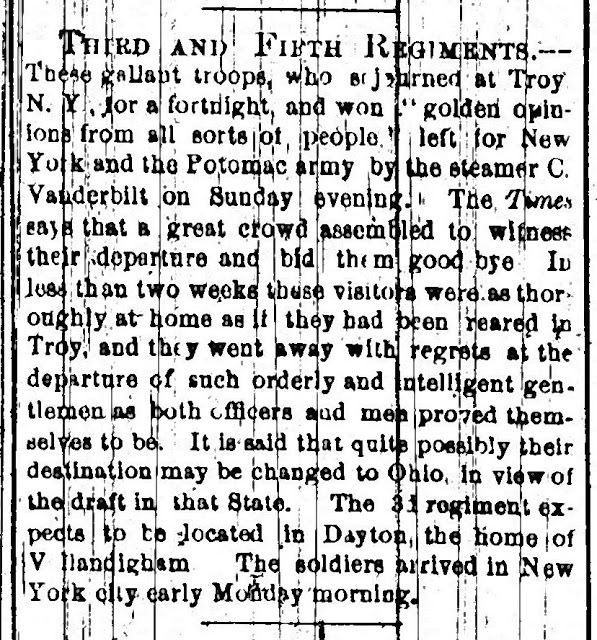 It's again transition time with the 3d and 5th Infantry leaving Troy. As usual the common soldier, including the newspaper's correspondent, has only rumors as to where they may be going next. New York City's Draft Riots again becomes a possibility. 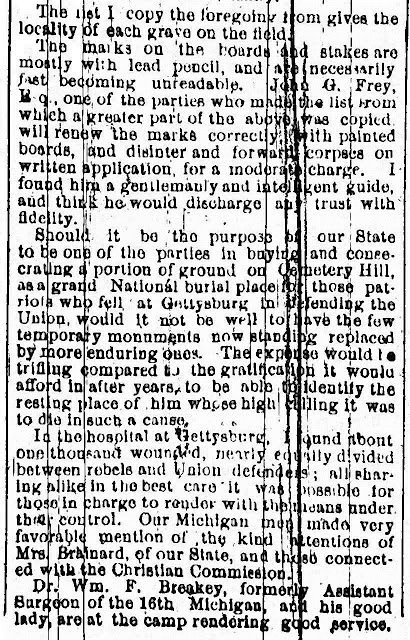 This is a chance to record the marked graves of Michigan soldiers, not just the Fifth Infantry, at Gettysburg. 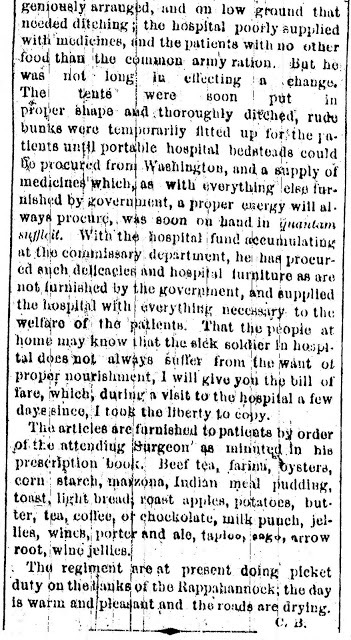 The author claims about a thousand wounded in the Gettysburg hospital, both Union and Confederate, so he states his list is hasty and may miss many. No attempt is made to mention any possibly taken to Confederate prisons. The Detroit correspondents are silent for a while and there will be nothing further published on the Fifth for almost a month. Yet another month will pass before more word from the Fifth. While this post doesn't specifically mention the Fifth, they were definitely the recipients of care by Elmina Brainard of Lapeer. Thanks to her, soldiers wounded at Gettysburg received care that otherwise wouldn't have been covered because of the problem due to hospital debt and mismanagement. More can be read about Mrs. Brainard in the book by the Michigan Civil War Centennial Observance Commission, Michigan Women in the Civil War, published in 1963. 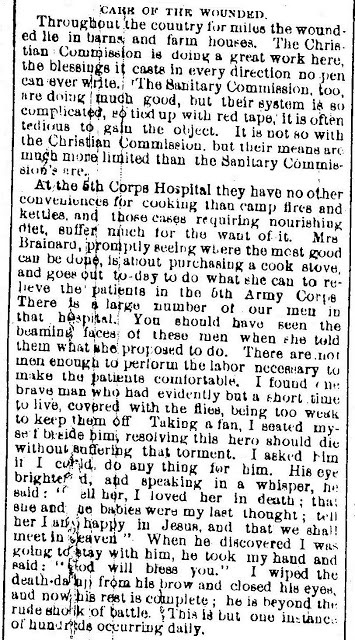 Among her many duties, she battled with doctors to get soldiers the care they needed and also spent hours cooking to help the men recover. December will be a remarkably active month for articles after the past few where there has been so little news. 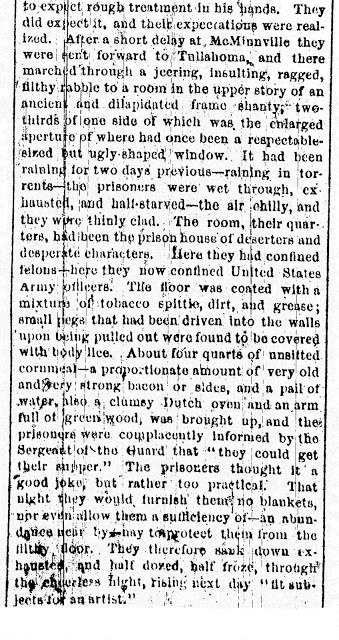 After two months when barely any news has come from the Fifth, today's article is about Libby Prison conditions. While the Fifth is never mentioned, I know that prisoners from the Fifth were imprisoned there. Both Will and Isaac Lerich were soldiers from the Fifth who experienced this form of "southern hospitality." The article has some flaws that can't be corrected nor guessed what the original said. I presume the headline says: THE REBEL BARBARITIES. 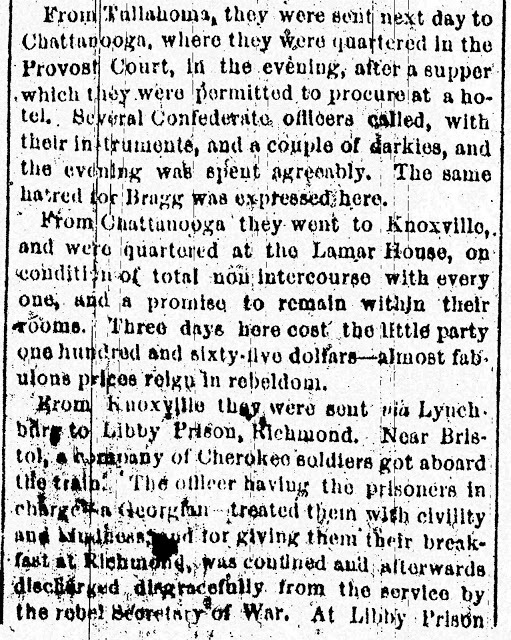 Many Union prisoners, including from the Fifth Infantry, were "guests of the Confederacy" at Libby Prison. Here's a brief UPDATE: That term was common among those who were Confederate prisoners. I meant to include a book called A "Guest" of the Confederacy; The Civil War Letters and Diaries of Alonzo M. Keeler, Captain, Company B, Twenty-Second Michigan Infantry -- including letters and diaries written while a prisoner of war by Robert D. and Cheryl J. Allen. This letter in the Detroit Advertiser and Tribune tells about life there. Notice that both this and the book describe conditions for the officers, from 2d lieutenants to generals. 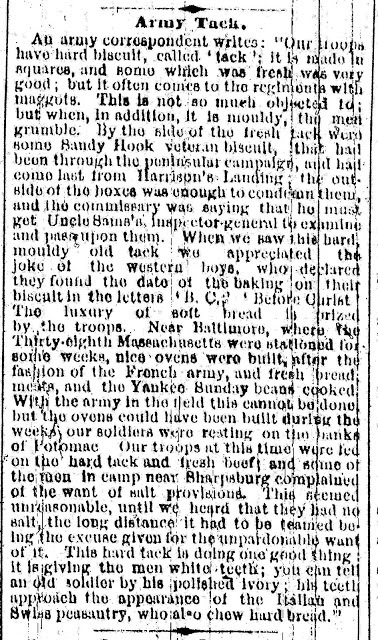 The delay of news continued with this being the Battle of Locust Grove from back on November 27,28,29. Correspondent G.W.W. explains part of the delay being his own severe wounding and being hauled around in an ambulance for six days and nights. G.W.W. 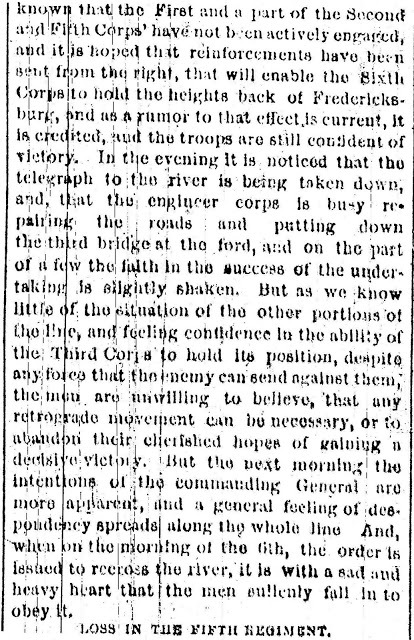 presumes news about the Battle of Kelly's Ford was already learned because New York newspapers reported it earlier. The article complains about internal poor communication within the army, too. Most interesting is his comment, "It seems to be our particular misfortune,or the intention of the commanding Generals, that we bear the brunt of every battle." Once again there is evidence of our dependence on the conscientiousness of the microfilmer. Apparently a fold in the paper leaves a phrase impossible to guess. 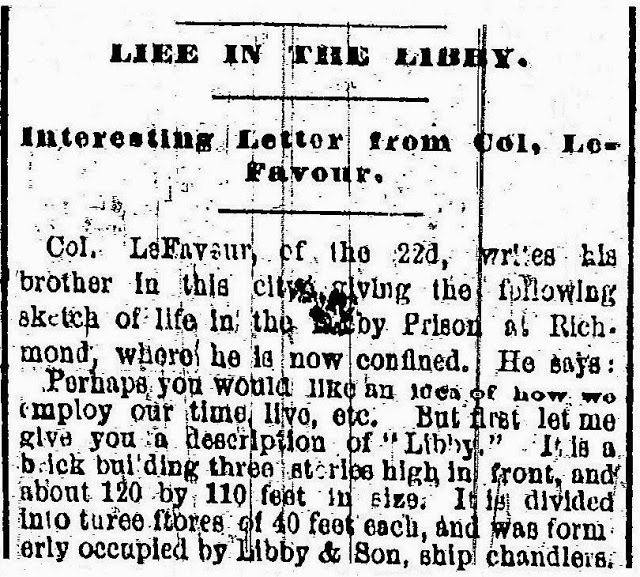 Here's more about Libby Prison and I repeat this mention of the book, A "Guest" of the Confederacy; The Civil War Letters and Diaries of Alonzo M. Keeler, Captain, Company B, Twenty-Second Michigan Infantry -- including letters and diaries written while a prisoner of war by Robert D. and Cheryl J. Allen. 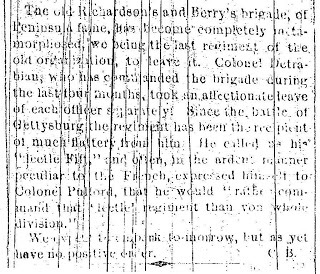 While many Union prisoners, including from the Fifth Infantry, were "guests of the Confederacy" at Libby Prison, these letters -- also from just a few days ago on December 9 -- and the book describe conditions for the officers, from 2d lieutenants to generals. The microfilm was skewed, but here is returned somewhat to as close to the upright as possible. As the year closed, the Fifth returned home for a while. 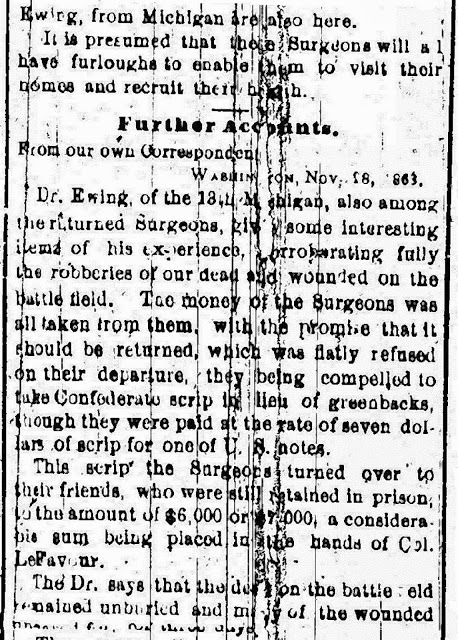 With only 1/8 of the regiment in service -- some of the missing may be in Confederate prisons or injured -- the Free Press, who normally expressed "Copperhead" views, actually congratulated and welcomed them home.